The Cerambycidae, or longhorned beetles, get their common name from their antennae. Characteristic of this family is the antennae are inserted in close proximity to the eyes, so that most have an indentation of the eye. Tetraopes carries this to the extreme, so that the antennae base actually splits each eye in two, hence its Latin name: Tetraopes tetraophthalmus = four-eyed four-eye. 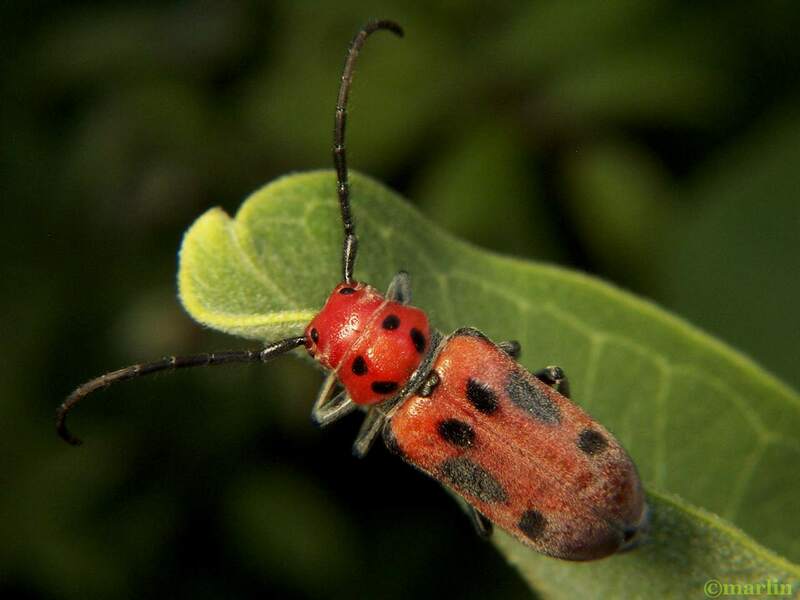 Tetraopes is one of the few insects that can safely feed on milkweed. (Asclepias spp.) Others include the Monarch butterfly caterpillar and the milkweed leaf beetle, Labidomera clivicollis. “Plant chemical defenses can be eaten by herbivores, stored, and used in defense against predators. To be effective defensive agents, the sequestered chemicals cannot be metabolized into inactive products. Utilizing plant chemicals can be costly to herbivores because it often requires specialized handling, storage, and modification (Bowers 1992). This cost can be seen when plants that utilize plant chemicals are compared to those plants that do not in a situation where herbivores are excluded. Caterpillar and adult monarch butterflies store cardiac glycosides from milkweed, making these organisms distasteful. After eating a monarch caterpillar or butterfly, its bird predator will vomit and will avoid eating similar individuals in the future (Huheey 1984). Species that feed on milkweeds are usually aposematically colored. Aposomatic species are those that “advertise” their distastefulness by being brightly colored (see Guilford 1990). 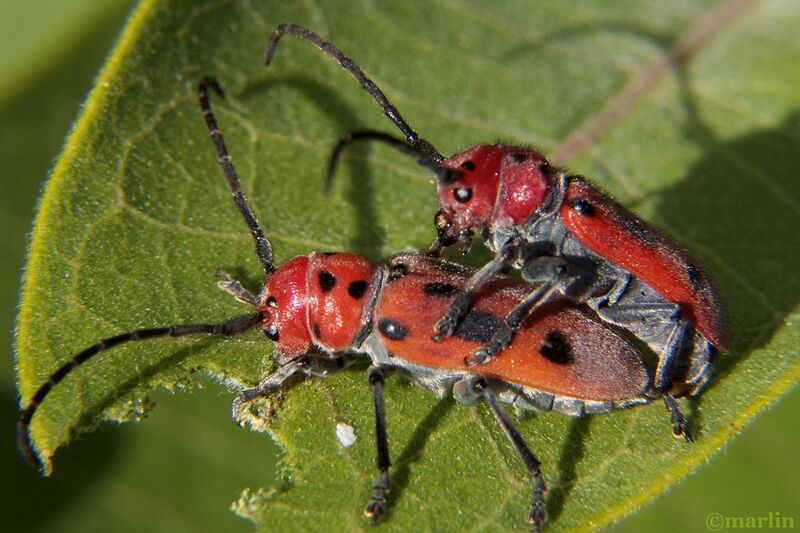 Two different species of milkweed bug in the family Hemiptera, Lygaeus kalmii and Oncopeltus fasciatus, are thus colored, with bright orange and black markings.” There are a whole range of insects sharing the “Orange and Black milkweed complex.” Red works too. There are those famous longhorn antennae. Beetles evolved before flowering plants, and it is thought the robust sensing organs helped the early beetle prototypes scavenge cycads and ferns. With over 20,000 species described, Cerambycidae is a large family. 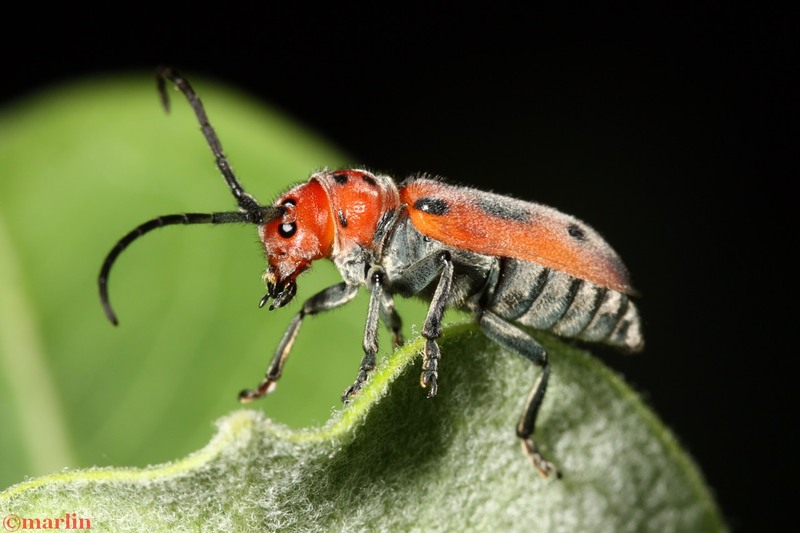 Many are serious pests, with the larvae boring into wood, where they can cause extensive damage to either living trees or untreated lumber, and adult beetles feed on various plants, sometimes causing grave harm. A number of species mimic ants, bees, or wasps (see Locust Borer). Here’s something you see every day – a worm’s eye view of the underside (ventral) of a milkweed beetle. Liquid poop bubble is a bonus. 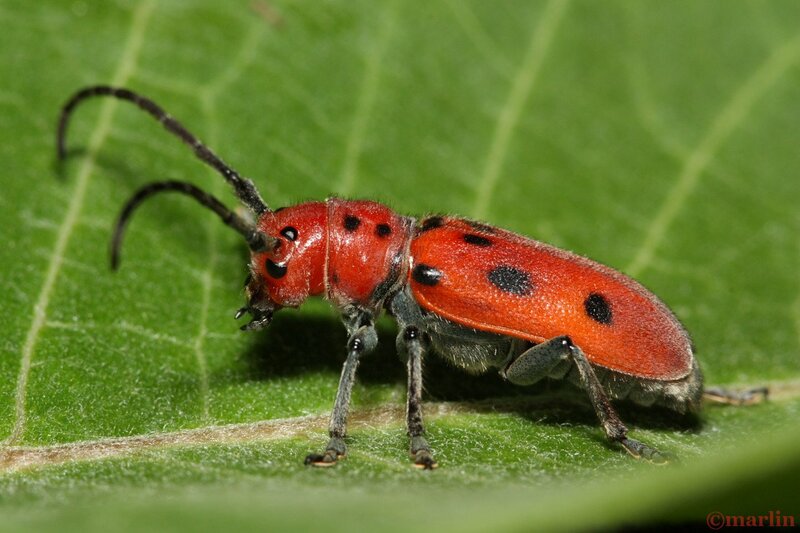 These critters are almost always munching on milkweed or related plants. Since the nutritional value of their food is quite low, they have to process vast quantities of foliage, and the water contained therein is excreted in copious amounts. 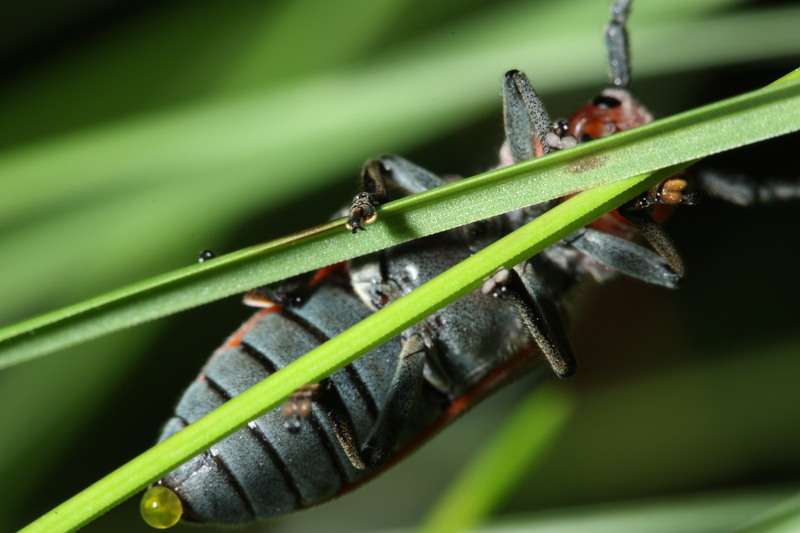 You might notice these insects are clinging to grass blades with the pads of their feet. They also have claws which act as anchors if they need more leverage.